This is a re-dubbed best-selling Japanese anime packaged for North American audiences. It is about a prince who is going to die unless he can find the secret ingredient to take the curse off his body. In search of this cure, he travels to the far east where he gets involved in a battle between the forest animals and the mining town inhabitants who are despoiling the environment. 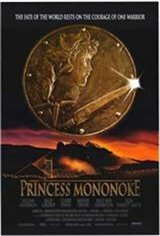 Leading the forest animals in the battle is a human raised by wolves named Princess Mononoke. This is a nature-based Japanese epic of the type that would be difficult to film in any other way than Hayao Miyazaki's bigger-than-life animated style.